Perhaps these Bulbul nestlings are polite only when they get clicked. 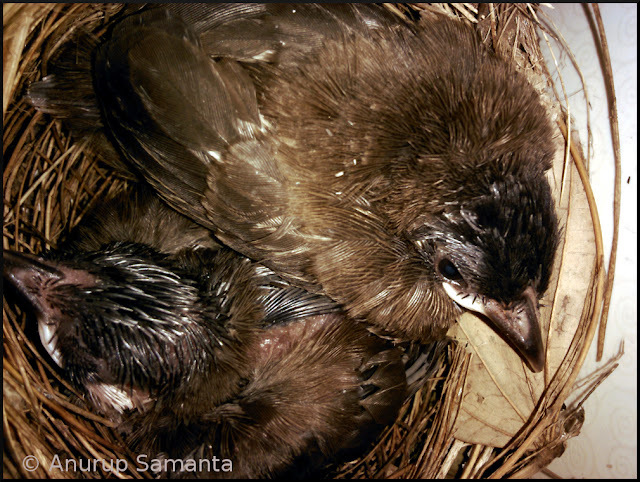 It is hard to believe how fast chicks can develop from meatball resembling hatchlings to fully feathered miniature versions of the mother bird within a short span of one to two weeks. 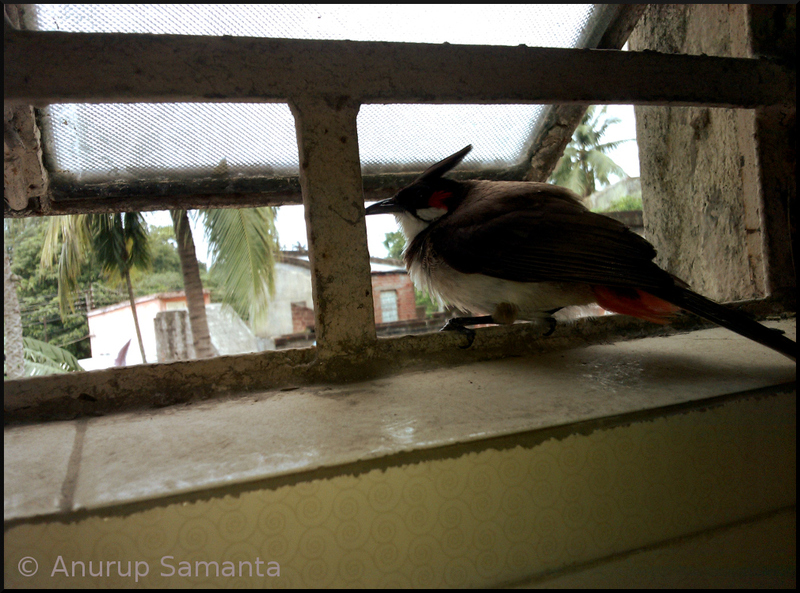 As these bulbul nestlings have developed some muscles (read 'wings') and probably impatient to leave my washroom, yours truly is back with the sixth photo story of this bulbul chapter (Click to read the First, Second, Third, Fourth and Fifth photo post of this bulbul series)! The dark plumage matches perfectly with the pitch black eyes of these nestlings. To meet their high metabolic demand they are eating whole day, and thankfully, not pooping on my bathroom floor. Strangely, the mother bulbul has become quite an aggressive lady! Even when I'm trying to take my bath-towel from the hanger in the vicinity of her nest, she is expressing her agitations like a deprived mob. Well, had she been behaving the same way since the initial hatching period I would have taken it as a natural response. It is beautiful to watch the mother feeding her nestlings while they're extending their necks out of the nest. When chicks are moving much inside the nest the mother is carefully controlling her kids with a strict chirp- "Easy babies, time isn't ripe yet". I wish to get another session of mobile clicks before these nestlings finally leave their nest. So, folks see you soon! The proud mother standing tall- Lady Bulbul of course! Nice capture. I had once shot the whole lifecycle of a pigeon right from the making of nest to eggs hatching and then birds flying away. Good thing they got feathers fast. Without them, I found them bit .... ugly? Few more days and they will be on their own. Nice of you to take care of them. You are doing a great work for humanity, Thanks for supporting Gardening beauties. Also check the best trampolines for kids in a very affrodable budget.